We might be in for a four-wheeled surprise from Nissan at the 2018 New York Auto Show as it sounds like Altima midsize sedan could debut with all-wheel drive for the first time in its history. Last month, for the March show, but gave little detail on what it would look like or from what engines it would find motivation. However, a recent interview with a Nissan engineer on (via ) has given us some insight into the redesigned Altima. The online show hosted Christopher Reed, vice president of components engineering at Nissan Technical Center North America, for a call-in session with viewers. One of the callers asked Reed about the future possibility of all-wheel drive on the Nissan Leaf electric car. Reed responded: “We know that in the future... especially in the North, people like all-wheel-drive cars, right? And we're talking about coming out with all-wheel drive on the Altima and that kind of stuff, so we're doing some new things there.” While the mention certainly isn't definitive confirmation the Altima will get all-wheel drive, it's at least a strong hint that Nissan is studying it from an engineering standpoint for the model's future. 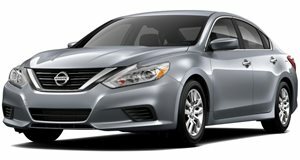 The new Altima is expected to heavily leverage design cues from the that debuted during the 2017 North American International Auto Show in Detroit. There's been no official word from Nissan regarding future drivetrains, either. As other automakers have been axing their larger powerplants for smaller turbocharged four-cylinder engines, the Altima is one the few midsize sedans left that still offers a thumping six-cylinder engine. Nissan's next-generation Altima will compete with other recently redesigned models, such as the , , and forthcoming . Volkswagen is also rumored to reveal a new later this year. The sixth-generation Altima will debut on March 28.